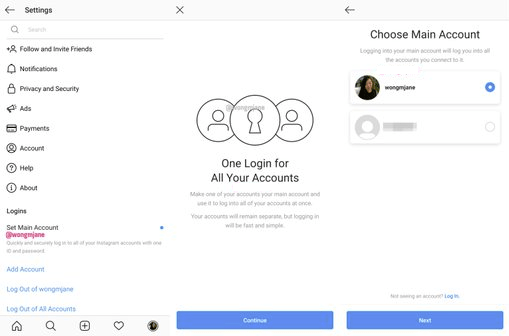 Instagram is reportedly developing an option to connect multiple accounts using a single login credential. This allows users to manage various Instagram presences with ease. TechCrunch reports that the new option will give Instagram users several account management options. It extends beyond the conventional handling of many business-related accounts. Social media researcher Ishan Agarwal tipped TechCrunch to the “Account Linking” code in the Instagram for Android alpha version’s APK file. For example, a key trend of younger users involves running secondary Finsta accounts. It allows them to share updates on delicate topics without fear of the judgment on their main profile. The Finsta trend reportedly pushed Instagram to develop more enclosed sharing options. It created the Close Friends groups to share Stories and the Favorites private list for regular posts. These options allow you to choose which groups of friends you like to share specific updates. The second option is still in the works. And it may be unseated by the new multi-account single login option. We still have to see if the feature rolls out to all users. But how many Instagram users run multiple accounts to merit this development? Many, but no actual figures from Instagram yet. While many users also run business accounts, the new single login option seems more in tune with the Finsta trend of personal profiles. Instagram is cooking up a solution to address it. But it will definitely hit the social network’s actual user account. Instagram has a billion monthly active users. What will the real numbers be if they account or discount this type of usage? Instagram’s usage will still be breathtaking. Secondary profiles may not be inflating Instagram’s active user count. It highlights the issue of all social networks on what user count actually represents. Facebook announced it will switch to new user count metrics in future quarterly reports.